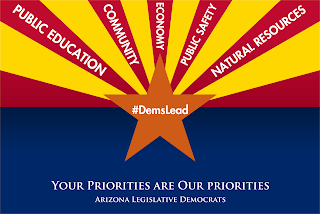 Legislative Democrats have a plan that will develop a diverse and resilient economy. Although we are getting close, Arizona still has not regained all the jobs lost during the great recession. The rest of the nation recovered these jobs by 2014, and employment in most areas of the country has now surpassedpre-recession rates. Arizona should be an economic leader. Moving our economy forward will require a reinvestment in innovation, infrastructure and job training so that the state can stand on solid ground and can weather future downturns. For example, it makes sense to recapitalize the Angel Investment Tax Credit. Arizona’s technology industries rely on angel investors through this program to fuel new and continuing innovations. Continuing investments under this program will generate thousands of jobs and millions in capital investments. Democrats also want to increase the cap on the refundable research and development investment cap because the program encourages small businesses to continue investing in research and development. This program supported over 11,000 Arizona jobs from 2011 to 2013. Arizona also needs to reinvest in job-training programs and restore funding for tourism. Democrats propose $3.5 million in permanent funding each year to job-training programs, since their funding source was eliminated by the Republican-controlled Legislature last year. These programs helps attract new businesses, and support small and rural Arizona companies providing job training to new and existing employees. Additionally, Democrats are working to restore a Republican funding cut to the Office of Tourism, so we can better promote our state and attract visitors. This would show Arizona is open for business and help generate millions in economic activity. Arizonans are independent and industrious. It’s time for the Legislature to reinvest in our greatest resource – the people who live here. To see a copy of the economic proposal supported by the House Democrats, including additional information on infrastructure development, click here. To see a summary of the Democrats’ full, five-step plan for moving Arizona forward, click here. 1]Arizona Commerce Authority, Arizona Research and Development Refundable Tax Credit Overview, January 2015 Update, page 4.